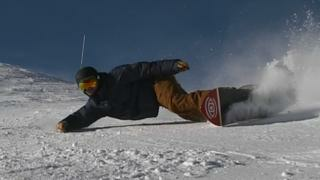 Ski Sunday's Ed Leigh demonstrates how to "blow people's minds" and perform a vitelli snowboard turn. Also knows as the Euro Carve, this impressive trick will have you snowboarding horizontally on the slopes. Fancy getting into snowboarding? Take a look at our activity guide to get you started.